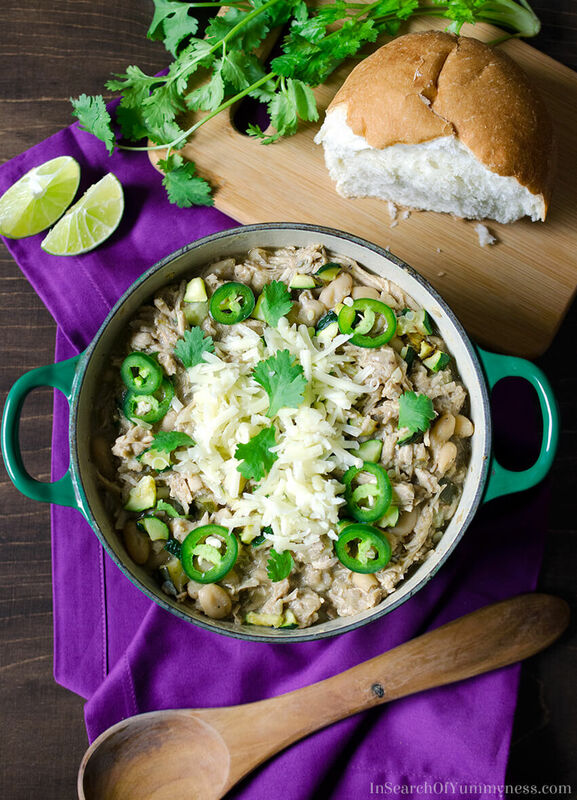 White turkey chili is milder and leaner than Texas-style chile con carne. This post is sponsored by Maple Leaf Foods. Do you have a picky eater at your house? I used to be a picky eater, but once I learned how to cook for myself that changed. I still won’t eat raw green bell peppers or baby kale, but generally speaking, I’ll eat most things now that I know how to prepare them. Being a picky eater isn’t always something you can grow out of though. Sometimes a person is particular about what they eat because they have food allergies, or a sensitive stomach (something to think about the next time you hear a kid complaining about their dinner). Adults who are picky, or “selective” eaters, can find it difficult to enjoy certain classic recipes. For example, while my mom and I will happily wolf down a bowl of Texas-style chili, my dad and brother aren’t big fans of the dish. My dad has a sensitive stomach, so spicy or tomato-based foods give him a lot of discomfort. My brother, on the other hand, has multiple food allergies which has led to strong aversions to several foods, including tomatoes. They’d like to enjoy the comfort of a bowl of chili though, so that’s how this white turkey chili came to be. Unlike tomato-based chilis, white chilis are mild in flavour and are generally made with poultry, instead of red meat. The chili maintains a white/light colour because there are no tomatoes or red chilis to colour the sauce. Instead, green chilis are added for flavour. Traditionally, poblano peppers are added to this dish. I almost never see those peppers in my grocery though, so I opted to use jalapeño peppers instead. Not only are they easier to find, but they are mild in flavour (especially if you remove the seeds and membranes). If you feel like you need more heat in your chili, you could try adding serrano peppers instead. The recipe is flexible that way. I wanted this white turkey chili to have a lot of flavour, but not a lot of heat. To get that “chili” taste, I used ground coriander, dried oregano and ground cumin, which adds earthy, smoky flavours. I also used a lot of onion and garlic, which builds a nice flavourful foundation for the recipe. The beans actually serve two purposes in this dish: they add fibre and they help to thicken the sauce. Some classic chili recipes use cornmeal to thicken the chili, but I wanted to keep this recipe simple, so I mashed some of the beans before adding them to the pot. It worked out great, so I’ll definitely be using that technique again sometime. 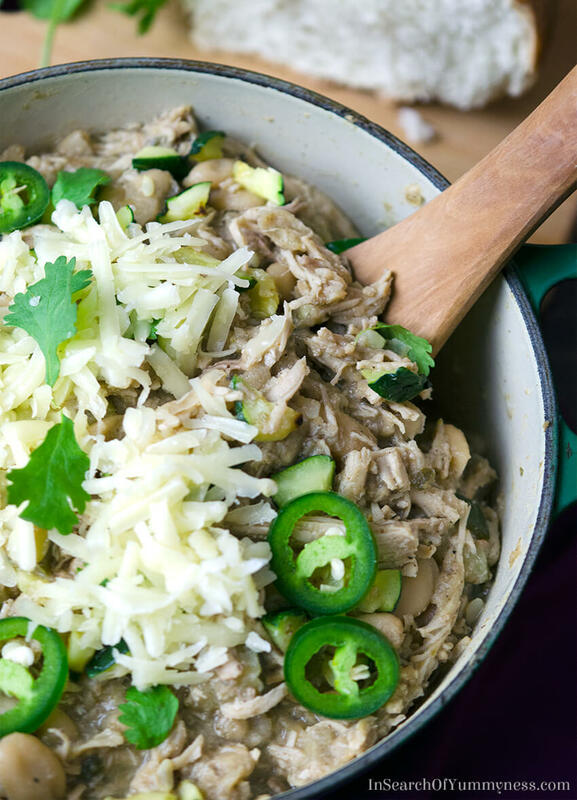 The key ingredient in this recipe is Maple Leaf Natural Selections Slow Roasted Shredded Turkey. This turkey is already cooked, so I don’t have to cook my chili for very long (or worry about not cooking it long enough to be safe to eat). 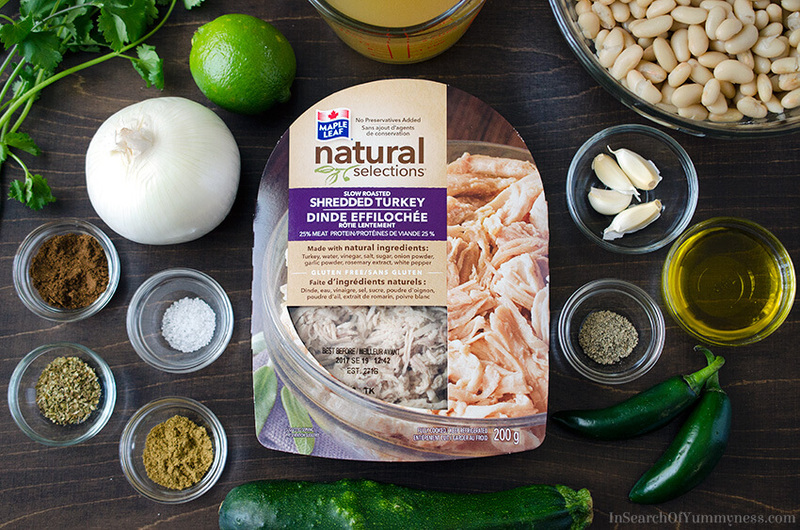 I love the fact that this turkey doesn’t contain any preservatives, and it’s made with all natural ingredients. It’s basically like turkey that I would roast and shred at home myself, but it’s ready and waiting for me when I get home from a long shoot day. The turkey is minimally spiced, so it has some flavour but it doesn’t distract from the dish you put it into. Once it’s cooked into this chili, you can’t even tell that I didn’t roast and shred it myself! I like to serve this chili with garlic bread, but it’s also good with lentil cornbread muffins or cheddar jalapeños cornbread. You could totally eat the chili on its own (it’s filling enough with the beans), but I like to have something on the side to mop up the sauces. 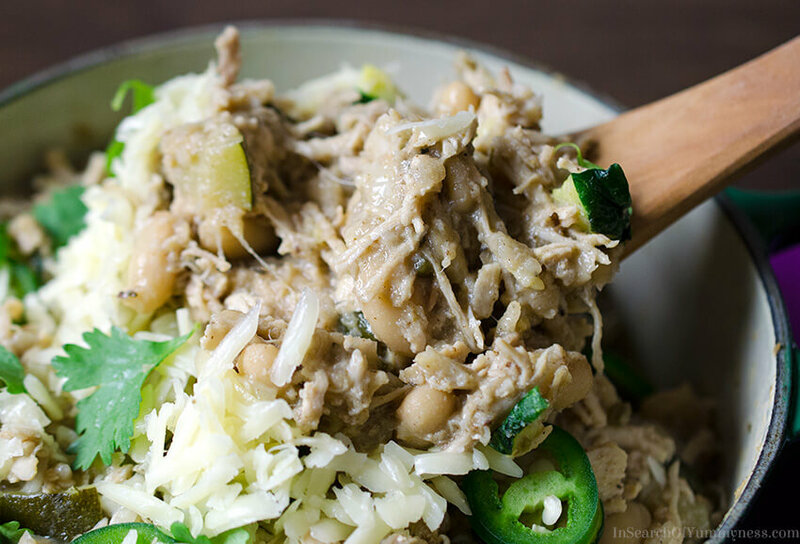 As with most chilis and stews, this white turkey chili tastes even better the next day. This makes it a great option to pack for lunch, or make ahead on the weekend for a busy Monday night. Leftovers reheat really well, but if your family is anything like mine, you might not have much leftover! I made this chili twice this week (to make sure the recipe was perfect, and get all these photos shot), and there’s almost none left in my fridge. My dad was able to eat this chili without issue, because I kept it mild and there aren’t any tomatoes in it. He didn’t put the optional sliced jalapeños on his plate. My brother surprised me by eating THREE servings of this chili tonight! First on buttered toast, then in a bowl with tortilla chips, then straight out of the bowl as is. He said that this chili has bit of sweetness to it that he likes, and he prefers the texture of the shredded turkey to the ground beef that I usually put into chili con carne. He picked out the zucchini, but I’m taking this as a win. 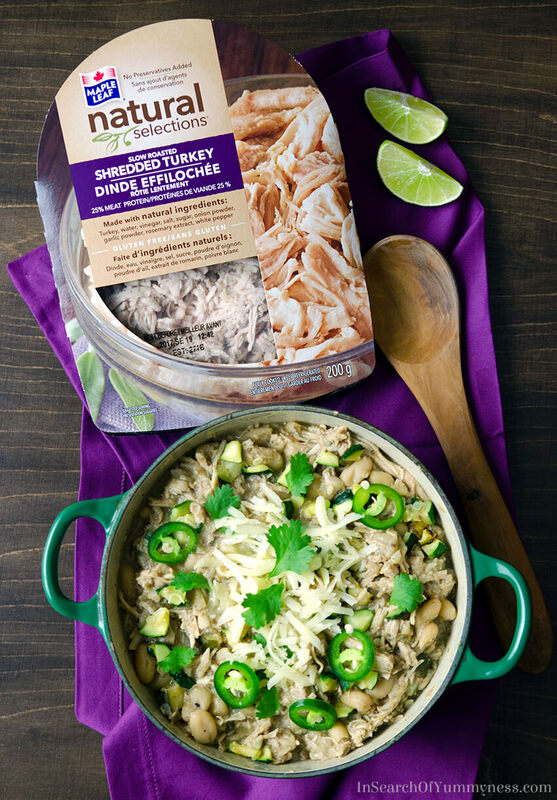 Ready-to-use Maple Leaf Natural Solutions Slow Roasted Shredded Turkey makes this recipe quick to put together on a weeknight! Add oil to a large heavy pot or Dutch oven, and place over medium heat. When oil starts to shimmer, add onions and a pinch of salt. Stir frequently and cook until onions begin to soften, about 5 minutes. Add jalapeño and stir. Continue to cook until onions are a light golden brown colour, about 7 more minutes. Add garlic and coriander stems, continuing to stir frequently. Cook for 1 minute, then add oregano, coriander, cumin and cayenne (if using). Cook for 1 minute more, then add chicken stock. Stir. Measure 1 cup of beans, and place into a medium bowl. Mash with a potato masher or fork, then add to the pot and stir. Add remaining beans, and bring mixture to a boil. Then reduce heat to a gentle simmer. 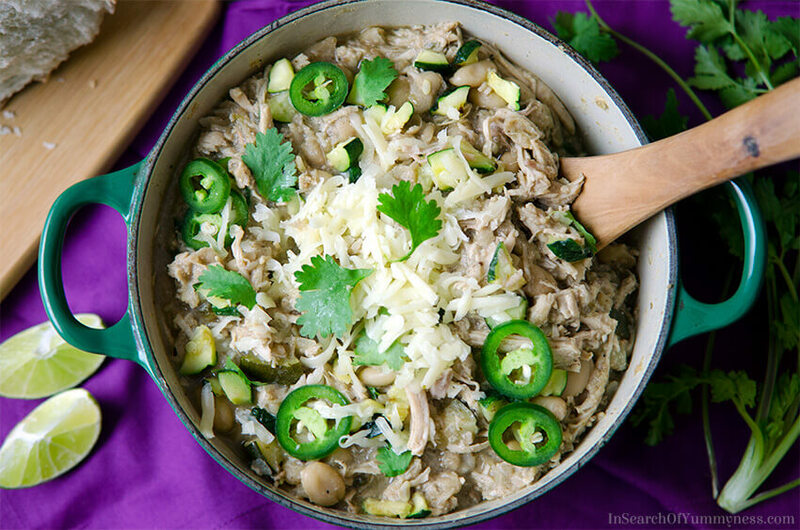 Add Maple Leaf Natural Solutions Slow Roasted Shredded Turkey and zucchini. Cook for 15-20 minutes, or until the chili has thickened and the turkey is flavourful. Finish the chili with a squeeze of lime juice, and adjust seasoning with salt and pepper. Serve with lime wedges and optional garnishes listed above. Tip: This chili tastes even better the next day! Please note that the nutritional information for this recipe is only an estimate, and has been calculated using a plugin. Please note that I only work with brands that I use at home and trust. Shareeba! Those colours are stunning! The purple against the teal is a feast for the eyes and the recipe looks amazing too! Nice way to twist a lean meat! I love all the spices in there, kicks it up a notch! Lovely recipe! I love Chili!!!! I just made myself a big batch, because i’m sick and all I can eat is mush food. So, thank god for Chili because chicken noodle soup gets old really fast! Your recipe is so different from the other ones. I can’t wait to try it. Thanks Stephanie! You’re right – you can only eat so much chicken soup before you get really bored of it. I hope you feel better soon!